June 20, 2017 (Rancho Bernardo) – Farouk Al-Nasser, president of the San Diego World Affairs Council, will offer his perspective on geopolitical events in the Middle at a meeting of the Rancho Bernardo Democratic Club on Monday, June 26th. In addition, former Assemblyman Nathan Fletcher will speak on the Voting Rights Act. Refreshments and registration start at 6:30 p.m. with the program starring at 7 p.m. at The Remington Club II, 16916 Hierba Drive. This event is free of charge and open to the public. September 3, 2014 (San Diego)--Three brothers in the Wise family went to war, serving in our military. Beau remains on active duty in Iraq. Jeremy joined the Navy Seals and Ben joined the Army’s elite Green Berets. A suicide bomber took Jeremy’s life in Afghanistan in December 2009. Just over two years later, in January 2012, Ben died in a firefight in Afghanistan. 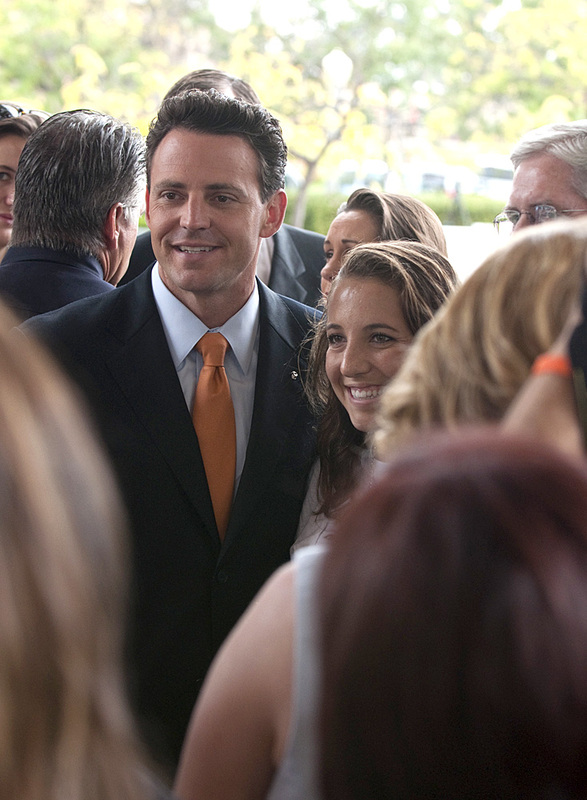 May 5, 2013 (San Diego) – Nathan Fletcher, former Assemblyman and Mayoral candidate, made headlines last year when he left the Republican Party to become an independent. Yesterday, Fletcher announced on his Facebook page that he has joined the Democratic Party. April 13, 2011 (San Diego)—Assemblymembers Marty Block (D-AD78) and Nathan Fletcher (R-AD 75) were honored with Legislator of the Year awards from Crime Victims United of California during an annual march on the State Capitol last week. The event draws victims from all over the state to join together and remind legislators that they will not be forgotten. February 17, 2011 (San Diego)--Assemblymember Marty Block (AD-78) today joined with San Diego County District Attorney Bonnie Dumanis and Assemblymember Nathan Fletcher (AD-75) to announce legislation that would provide notification to victims and their families when the Governor considers an application for commutation of a sentence. In December, outgoing Governor Arnold Schwarzenegger provoked outrage locally when he commuted the sentence of Esteban Nunez, son of a former Assembly Speaker. Nunez pled guilty to involuntary manslaughter in the near-fatal stabbing of Louis Don Santos, 22, near San Diego State University. November 12, 2010 (El Cajon) – John Holsheimer has been sentenced to a maximum of 300 days in jail, five years probation, and 320 hours of community service for killing Bridgette Hale, mother of an infant son, in a head-on collision January 24th on Highway 67. Holsheimer must also undergo 90 days of drug rehab at his own expense, pay $4,700 in restitution costs to the court, and is prohibited from coming within 100 feet of a casino for the rest of his life.